I ran 11 seconds slower than I had hoped, felt as though I could have run much faster, and stepped on someone’s foot after the finish line and severely sprained my ankle. It was a rather unpleasant experience. The roads were slick from heavy rain and it was difficult to gain firm footing. More than anything, the field was packed. Not wanting to sneak through the crowd to the start, I wound up starting toward the back of the pack and spent almost the entire race jockeying for position. This was mid-race and looks as though it could have been at the start of a major marathon. My thanks to Terence and Kevin for running as well, and a huge, huge thanks to Kelli Buck for coming out to cheer. I’ve got a few weeks to get my ankle healthy and train up for the Navy Mile on Sept. 30th. Sunday featured a progression long run. I was supposed to do 8 miles: 4 easy, and then three at increasing speeds with brief jogs between, followed by one easy. I headed out early in the morning despite not feeling awake. Two miles in, I quit. I just had nothing. Dead legs, no energy, no willpower. Nothing. So I turned around and walked/jogged back home in the heat very disappointed with myself. Later that evening, I managed to execute the progression on the treadmill. It was fairly tough: Miles in 8:50, 6:40, 6:30, 6:20 with one minute rest between. I managed. I didn’t get the long-run stimulus I was hoping for, but the miles were still probably helpful. Tuesday night was the monster. This is the kind of all-out effort that standout track and XC coach, Steve Magness, calls a ‘Seeing God’ workout. Blue/Magenta Team tried to wait for the heat and humidity to die down…. without much success. It was about 88 degrees and 85% humidity when we finished our warmups. Though the results weren’t ideal, they weren’t too discouraging. The conditions were far from enjoyable. I was pleased with the overall effort as I was completely exhausted following the last 200m sprint. Murat was…. just fine. Thursday night meant the Red Team was taking to the track. Murat and I were hoping that the Coupers would join us, but they came up with some mildly-tolerable excuses. While I had a tough 6x800m workout that Murat might join me for, his main reason for stopping by was a 600m all-out time trial. Murat has agreed to let me train him for an 800m race – hoping to get himself back under the 2min barrier – and this 600m would be a good temperature-check. Speaking of temperature, it was still in the 80s when we first hit the track around 7:30pm, but far more pleasant than the midday heat. After a few miles warmup and some strides, Murat threw on his spikes and stepped onto lane one for his time trial. In fact, he looked so good that its not out of the question that he could run a sub-2min 800m right now. If that isn’t great coaching, I don’t know what is. The workout went well… on paper. I hit the splits just fine, averaging about 3:02, but I felt terrible. My legs were heavy and tight and it was a huge mental drag holding that pace. I should be able to run at 6:10/mile pace without that much discomfort. Following the intervals, I began my cool-down jog and felt incredibly light-headed. I’ve had some weird sinus-type-headache lately. Rather than risk it, we just walked a half mile. Oh well. My legs were a mess following the workout, but I’ll take the result and move on. Two more tough workouts before 5th Avenue – one on Sunday, and then a real monster on Tuesday. Background: Last year, I ran this race as the 5th race of the 30@30 campaign. It was my first 10K in over a decade and my goal was to run a hard race, negative-split the second half, and use it as a fitness test. I was pleased with my result, averaging 7:45/mile pace for a finishing time of 48:16. This time, I would also be using the race as a fitness test of sorts. My goal was to negative-split each third of the race and run hard. Despite coming off an annoying cold/cough and gearing my training toward shorter distances, I figured that if I ran smart and hard, I could finally break the 40min barrier. My primary goal, however, was mental training. I wanted to use this opportunity to continue to build out my pre-race routine and then focus on executing a mental race plan. Seriously. One second. All I could do was laugh. Still, it was good for a 10K PR and scored 1st in my age group and 9th overall (out of 364). I do think that I could have redlined for a little longer and pushed a little harder. The race generally went according to plan… I started off smooth and controlled on the hilly first two miles, averaging 6:45/mile as planned. The next two miles were faster as they were a net downhill and I was feeling okay, despite some foot pain. (Aside: Ran in my new Pegasus Turbos, which were great!). The fifth mile was mostly uphill and I kept an even effort, but my pace crawled to 6:45 once again. The final mile started off with a big uphill climb and then was mostly downhill. Chasing down a few runners I had been eyeing throughout the race, I ran a quick 6:10 sixth mile. The final 300m to the finish were on the track, and I ran a quick 48 seconds (4:39/mile pace) through the line, but apparently I was a tad too late in my kick to break 40. Sigh. Stepping back, the biggest takeaway has to be my improvement from one year ago. Last year I finished the race equally exhausted in a lumbering 48:16. A year later and I’ve knocked 8:15 off my 10K time. Sadly, its a virtual genetic impossibility that I’ll ever knock another 8min off my 10K PR… but I certainly plan to get faster if I can stay healthy and focused. When the challenge began, a running friend (thanks, Becca!) told me to check out the work of a guy named Matt Fitzgerald. He writes about endurance training and nutrition. Jess said she was well-aware of his writing. “He’s a good writer. Smooth, easy-to-read prose,” she said. 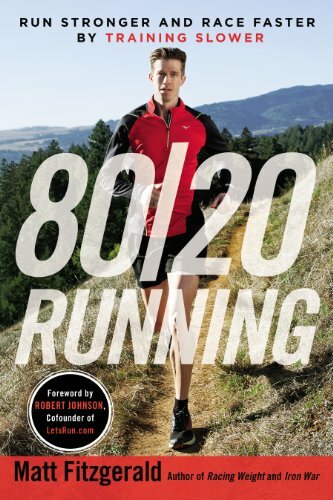 I checked out his books – mainly Racing Weight and 80/20 Running. They completely reshaped my uneducated view of running and I began to model my training after his approach. This guy seems like a dynamite coach – maybe he’d be willing to work with me? So I tracked him down through his website. I sent him an out-of-the-blue email telling him about the 30@30 campaign and asking if he’d consider helping out. I didn’t really expect a reply. He shot me back a note right away. He was in Arizona, finishing up a summer of training with the Hoka NAZ Elite team and getting ready to attempt a marathon PR in Chicago. If I could wait until late October, he’d be happy to help work with me as a coach. Of course, I could wait! After his stunning 2:39 marathon PR, coach and I had our first Skype get-to-know-you session and we talked about the Campaign and my running history and goals. Matt was intrigued by the unique challenge of training someone for such a busy, diverse racing schedule. Training for this many events year-round simply isn’t done. It would be a new coaching experience for him. Over the next nine months, coach and I would chat almost daily. I probably communicated with him more than anyone else in my life, save Jess, Savi, and Russ the Doggo. He not only whipped me into shape and managed to work around a few untimely injuries, but he also quickly figured out the kind of coaching and motivation I needed. We built a candid, brutally-honest coaching/coachee relationship that was unquestionably the single most impactful element of my training this past year. There is absolutely no doubt that any success I enjoyed was driven by his coaching wisdom. He introduced me to 80/20 training, the value of strength work, and strategies for mental preparation. Looking back, it’s crazy to me to think that I could have even tried to do this without him. Now, I talk about Matt’s work constantly. “Matt says…” and “well, let me see what Coach would say…” My wife now refers to him as “your coach/boyfriend Matt”. Normally, working with a coach of Matt’s experience and expertise costs a pretty penny. But Matt did it all on his own time and dime for a place he’s never been and for kids he’s never known. I would constantly hound him to see how I could help him and somehow begin to return the favor. Could I introduce him to someone I knew? Could I help promote his new books? Nope. He never asked for a single thing. He would just say “Jake, that’s not what I’m doing this for,” and change the subject. Well, coach, I may not be able to precisely articulate your motivation for giving this thing a shot… but I do know what you did for me. You helped me rediscover something that was once so important to me. You got me healthy and held me accountable to myself and to the Campaign. You turned me into a half-decent 30-year-old runner with some pretty absurd/ambitious goals for the next few years. You ignited a passion for learning about the sport that has already inspired me to take up my own coaching. You’ve got me hooked on running. You gave me so much time when there was so many other books, articles, coachees, and conversations requiring your attention. If I look at how I spend my days now, physically, intellectually, and emotionally, there is no way around saying that your guidance genuinely changed my life for the better. So thank you, so, so much. More than I can express. And coach, if by some miracle I can continue to stay reasonably healthy, finally get to my racing weight, and continue to improve to the point where I can reach that lofty goal we’ve talked about (definitely not saying it publicly), then you had better plan on flying to the east coast and joining me for a race. When I first thought about running 30 races, two things came to mind. 1) This is going to be exhausting. 2) This is going to be expensive. Enter: Potomac River Running. I had shopped at my nearby PR store a few times before and was impressed with their selection and ethos. I figured, hey, maybe I’ll see if they’d like to get behind this cause and help me out. So I sent an email to PR…. not sure if I’d hear back. Keira wrote back right away. Yes, they thought this was cool and yes, they’d love to help. Because PRR also hosts a lot of races, they would be able to hook me up with discounted entry to their events in support of this cause. But I got a lot more than that. I discovered a great community of runners and a small business that genuinely wanted to positively influence the local community – and was completely on board with walking the talk. I wanted to get more involved with PRR and they made it easy. I started helping out at some races. I was asked to help coach some of their training programs. Most importantly, I met some really great people. I got to know Keira, Ray, Becca, Cathy, and Terri. I met some outstanding coaches in Mike and Scott. Russ and I take walks over to see Phillip and Caroline at the Ballston PR store 1-2x per week and he loves it. He’s their best customer. I was looking for a group that could get behind a cause… I found a terrific group of run-o-philes that I’m psyched to continue to run along side (pun). Thank you, PR Running, so very much! My legs felt pretty good… which probably meant the hill wasn’t steep enough. According to some Google-enabled calculus, it was probably a 5-6% grade hill. Maybe more slope needed? I decided to do this run calorie-depleted. Ouch. Normally, my legs really feel the depletion about 80% into a run… this time, it was about 60% through that I really started to feel it. I timed my run so that I would finish nine miles and arrive at the local track for the 10th and final fast mile. After maintaining a pace that hovered around 8:30/mile for the first nine, I adjusted the tempo well and managed to knock out the final mile in 6:07! A good result – and a bit surprising. This moderate workout felt pretty good – I managed to maintain around a 6:35 pace for the hard sections. In retrospect, I probably should have cruised a bit slower. My legs were pretty dead for this one… but I generally managed to hit the 2:10 mark, though I had to walk/jog the last two 200m rolls. 31 days away from the 5th Avenue Mile in NYC! My training has been challenging – I have no idea if I’m on pace (pun) but it has certainly beat up my legs. Amateur heats will be in the morning and the pro heats are usually around noon. I expect my heat to start between 8:30-8:45am. If you’re in NYC – come run or watch! Sunday’s long run with Murat wound up being the second longest run I’ve ever been on (besides my half-marathon race)! Our 12 miles at 8:07 pace on DC’s canal path took about 1:37 and were so much more enjoyable with a partner. Curveball: I did this as a depletion run, going calorie-starved for about 12 hours prior to the run. My legs and abs began to feel it the second half of the run, but it wasn’t too bad. And my Gatorade post-run tasted so, so good. Then on Tuesday, I dragged Murat over to the track for my one-mile repeats. The workout was meant to be challenging, but not impossible. Murat ran his own version of the fast mile repeats – leaving me halfway through the first mile and hammering a hard 800 to finish, and then doing the same for the last quarter-mile of the second go-round. He blitzed the last 400 in a scorching 63 seconds. My legs felt heavy a day after Monday’s lifting session, but my breathing was controlled and I managed to handle running 6:17 and 6:18 for the two hard miles respectively. Next hard workout: 10 x 30sec hill sprints on Friday morning. Fun.